We're just four days into 2019, and it's already been a big year for Oreo. On January 2, the brand released Dark Chocolate Oreos, which are legitimately delicious. As if this decadent, flavor, the first in Oreo's history to be made with real cocoa, wasn't enough to start the year off with a bang, the cookie company surprised fans by quietly releasing another new flavor this week. Over the past few days, shoppers across the country have begun seeing Carrot Cake Oreos pop up on their grocery store shelves for the very first time. Rumors of the release of Carrot Cake Oreos began swirling on social media last month with several snack fan Instagram accounts posting about the product. It wasn't until we saw the boxes available online from both Target and Walmart that we knew the treat was more than just a rumor. 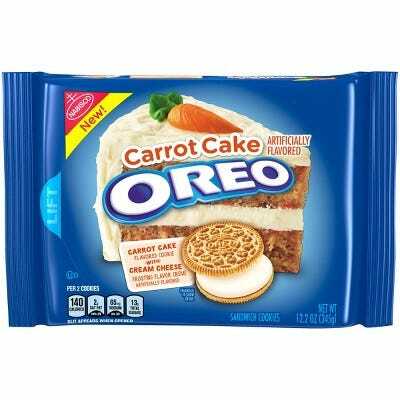 According to the packaging, the cookie features cream cheese frosting-flavored creme sandwiched in classic Oreo fashion between two carrot cake-flavored cookies. It's unclear whether, like its contemporary the Dark Chocolate Oreo, the Carrot Cake Oreo is a permanent flavor or if it is seasonal and will disappear from stores after Easter. We reached out to Oreo for more information on the Carrot Cake Oreo release, but have yet to hear back. We will update this piece as we learn more, but just in case this is a seasonal release, we're planning on stocking up while we definitely have the chance.